Forging makes a return in Dark Dawn! But Yallam is out of our reaches in this adventure, and who knows where Sunshine is after all this time, so who takes up the hammer to smelt the raw materials gathered by the heroes...? 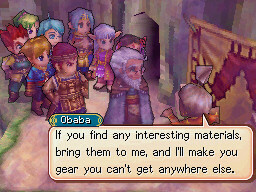 Believe it or not, it's Eoleo's great-grandmother, Obaba! Bring her the materials you find during your quest, step out to the World Map, and return to find a rare piece of equipment made for you. You can't really control what you'll get, so if there's something you're aiming for, be sure to save your progress before you hand any materials to her. Enter the sanctum and go to the back room to enter a cavern. Move the Zol right, down, right, and up so you can advance to an area with a chest. Drain the water bowl in front of the ship to lower the water level. Going to the top route will lead you to a Mercury Djinni, and the opposite route will lead you to a chest. In the chest inside the Jupiter room (B5). In the right side chest at the entrance. Himi's Search Psynergy is needed. In the top chest on the bottom part of the 1st level (B2). In the bottom left chest of the 3rd level (B5). Use Crush on the boulder in the room where you found Vine (near the exit) to find a room with a chest. After the eclipse, enter the city from the west side. Enter the building to the left of the weapon shop and go upstairs. Once outside, leap to the building on the left, go downstairs, and use Crush on the boulder. At the top of the peak. Use Crush on the boulder in the beginning of the second area. Upon entering the maze for the first time, go north until entering a room with a chest. In a chest near the front of the ship. In bottom right chest on the first level (B1). You need to get the Cave-door key from Obaba's room (top right room of 3F), before entering a secret cavern near the boats outside. Push the pillar with heat into the hole, then use Eoleo's Thermal to rise to B1. In the top chest on the bottom part of 3rd level (B6). The top left chest on the 5th level (B9). In the bottom part of the 4th level (B8), in the top right corner. In a chest in the final room of Crossbone Isle (B9). The one that creates the Rune Blade is found in the shallow sea south of Yamata City. The one that creates the Kikuichimonji is found in the shallow sea southwest of Yamata City. 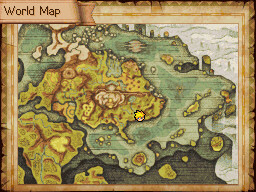 The one that creates the Thanatos Mace is found in the shallow sea between Kolima Forest and Harun Village. The one that creates the Sagittarius Bow is found in the final room of Crossbone Isle (B9).